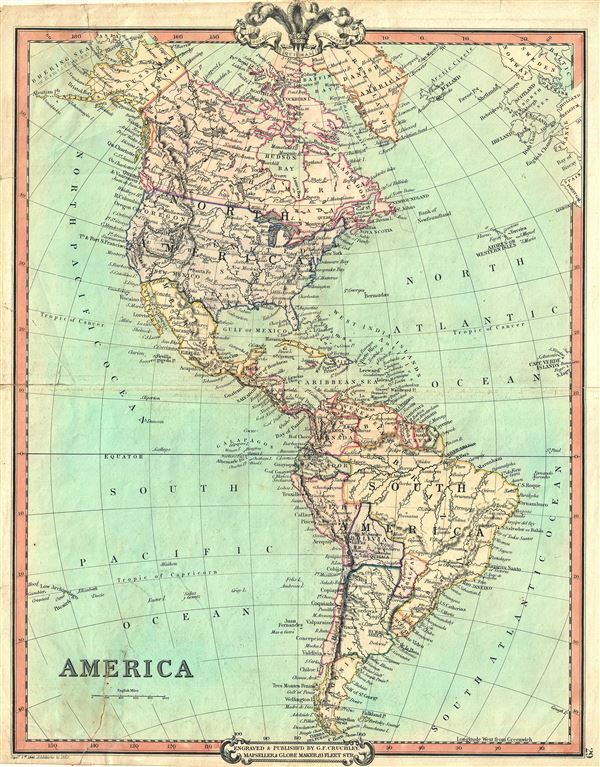 This is an attractive 1852 map of North and South America by George Frederick Cruchley. The map covers all of North America as well as South America from the Arctic to Cape Horn. In North America, Russian and British territories in Alaska and Canada are clearly noted. In South America, Chili extends southward only to the border of Patagonia, while Bolivia has a coast. Cruchley divides the territories and countries with color coding and notes major cities, rivers, mountains etc. Elevation is rendered in hachure. The map offers several elements of considerable cartographic interest. This is the first time in this series that the name 'Oregon' appears on the map and the United States border is set at the 49th parallel following the Oregon Treaty of 1846. In the first half of the 19th century the Pacific Northwest was the last frontier in the century's long slaughter of the American beaver in the name of European fashion. Both the British, in the name of the Hudson Bay Company, and the Americans, championed by John Jacob Astor's Pacific Fur Company, were eager to claim monopolistic right over the region. Astor's establishment of Fort Astoria on the Columbia River only served to further tensions with the Northwest Company - the Pacific subsidiary of the Hudson Bay Company. The dispute escalated, giving rise to the Oregon Boundary Dispute and the American expansionist slogan 'Fifty-four Forty or Fight!' The dispute was not resolved until the 1846 Oregon Treaty which, through concessions on both sides, formally set the boundary at the 49th parallel. This map does however predate the Gadsden Purchase despite postdating the Mexican American War, consequently the R. Gila is the southernmost boundary of the United States. The 1850s were a period of both great hope and simmering tensions in the United States. With the end of the Mexican American War and the signing of the 1848 Treaty of Guadalupe Hidalgo, the United States acquired vast new territories. The discovery of gold in California in 1849 initiated and mass trans-continental emigration in the quest for wealth and land. California was admitted as the 31st state in September of this year and the cities of Los Angeles and San Francisco were incorporated. Meanwhile, tensions continued to rise between the slave holding agrarian southern states and the industrialized 'free' northern states. The Compromise of 1850, intended to placate the slave holding states, essentially divided the United States along lines that, by 1861, would degenerate in the American Civil War. Meanwhile, much of South America was, at this time, embroiled in or was about to become embroiled in, severe civil strife. The new nations, freed from Spanish dominance though various wars of liberation in the previous decades, were struggling with their newfound independence in an attempt to create stable and prosperous governments. Most would dissolve into civil war between 1858 and 1864. Cruchley, G. F., Cruchley's General Atlas, for the use of Schools and Private Tuition, London, 1853. Good. Some toning over original centerfold. Verso repair over damaged area near upper and lower margin. Professionally flattened and backed with archival tissue. Blank on verso.